The first bus stop, the week of February 27, is on the west coast of Mexico, the Pacific ocean facing city of Puerto Vallarta. Our local host is Laura Aguilar, a professor who teaches tourism at the University of Guadalajara in Puerto Vallarta— “Centro Universitario de la Costa”. Follow Laura on Twitter at @LauraAguilar68 and @turismoudeg. The Kean University students will connect with Laura and some of her students in class Wednesday, March 1. Since she knows much about food (especially chocolate) we have planned some pre-meeting activities, that everyone can join in, that start with our own relationships to cooking, eating, etc. We are asking those on the bus to share what they know about Puerto Vallarta and Mexico (Laura’s locale) as well as the Northeast USA and New Jersey (Kean University locale) in an open Google Document. Then it will be up to our #netnarr students and participants to blog about our connections found in this bus tour stop. 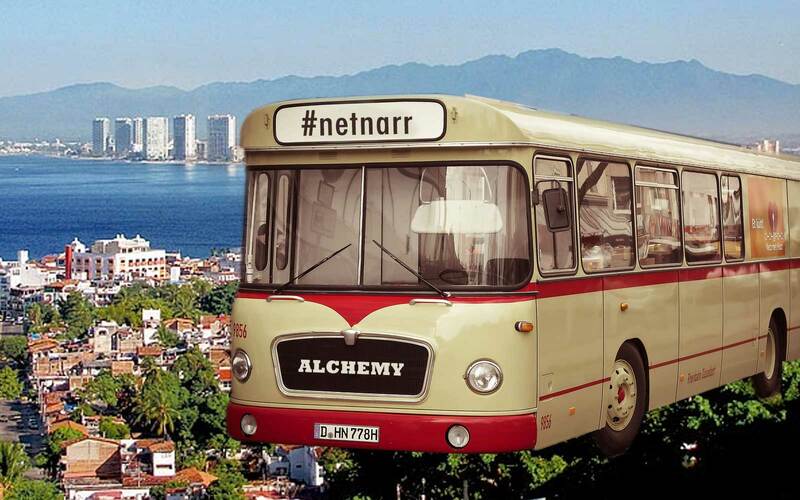 Favorite moment today in #netnarr virtual visit to Mexico– when asked about border walls Alondra said "The first border is in your mind"
Featured image: “Bus” pixabay photo by MichaelGaida shared under a CC0 license edited to add “netnarr” and “Alchemy” to the bus superimpose in an aerial photo of Puerto Vallarta.